Last Spring I dismantled the old garden shed I had inherited when I bought the house. The roof and floor were completely rotten but the side that was closest to the neighbour’s fence had been sheltered from the elements and some of the wood was still in usable condition. I stacked it at the bottom of the garden and set to renovating the house. As part of my mission to live a more sustainable life I had a wood burning stove installed in September. I stacked my wood supply on an old kitchen door and used the old shed door to keep the rain off as best I could, with some waterproof sheeting at the edges and in the gaps which were exposed. The downside to this was that some of the wood got soggy and mildewed as the air could not circulate properly. This Spring, while tidying up the bottom of my garden, I came up with the idea of upcyling the old shed and building a logstore with the saved wood. After looking at a youtube video, I realised that the door, sawn in half across the middle, would make the perfect base. I removed the slats and cut some of the old side posts to length to create a grid for the wood to lie across and to allow the air to come in from underneath. I also added a couple of pieces of post at right angles at each corner under the frame, so that it is standing another 3″ higher off the ground to help keep the wood dry. Then I made frames for the side panels from other posts, while reusing the wooden slats on both the side panels and across the back. The other half of the door was used for the roof. I left the slats on this to keep the rain out, but cut the front posts down in height and set the door directly on the front cross spar so that the roof is slightly pitched and the rain can run off. Reusing the old door frame has made the log store really sturdy. Let’s hope that by the time the autumn arrives I will have managed to acquire a stock of wood and that it will be dry enough to burn! If you are a seasoned wood burner and have some great tips, please leave your comments below to share with others starting out on the journey of working with nature. Have you ever made anything from an old shed? In these unsettling times we are becoming ever more aware of the pace of change and it’s easy to feel that things are beyond our control and that we don’t have a say. But what if we decided to make our mark in our own way – not in the ‘old fashioned’ way of protest marching or casting the ballot for the same old party politics just with different coloured rosettes, but in a new way – with our purses and our feet. What if everyone decided all at once that “same old, same old” wasn’t good enough, wasn’t what serves us or the planet, and from that moment on we all did things differently? Buy vintage: There are so many shops springing up offering good quality vintage clothing and often vintage fabric which predates the chemical saturation era. Most is so well made that it may even have a longer shelf life than something you buy today. And anyway who wants to be a High Street clone? Oxfam offer a selection of vintage online. Google vintage clothing with your town name or look on Yell in your local area or Freeindex. Jumble sales, community sales are making a comeback. Check out your local newspaper or parish magazine for boot fairs many of which will be in full swing by Easter. 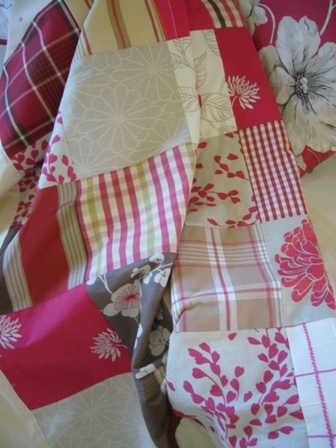 Make patchwork curtains and cushions: If your budget is tight and you have fabric to hand but not enough of any one, make a pretty patchwork or bands or stripes of colour. Buy a small piece of fabric to enhance what you already have and to create a coherent theme, for example, if you have lots of pink or red florals, buy some blue striped fabric, or polka dots as a contrast. Great for completing that shabby chic look. If your skills are a bit rusty, ask a friend or neighbour to help you. It’s fun sewing together, with tea and cake! If you are just bored of the style and feel of the room, how about making a Roman Blind out of an old curtain? This will make a room feel more fresh and modern in an instant. You don’t have to spend lots of money on tracks either. A wooden baton works just as well. Prefer a minimalist look? Wooden shutters are becoming more popular. They last a lot longer than curtains and are easy to maintain. 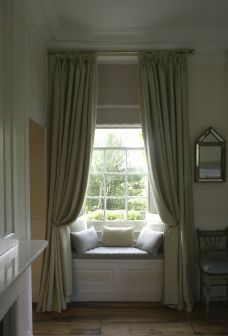 When it comes to warmth and elegance, you just can’t beat a good pair of hand-made, interlined curtains though. They can set the tone of the room, and bring a softness and feeling of intimacy to a space. Organic fabrics for are becoming more readily available and gradually more affordable as the technologies improve, demand increases and production prices of cheaper fabrics worldwide begin to rise. You often only need to spend a little more to get healthy, quality organic cotton, linens and organic hemp which will last for years, meaning that over the product life cycle they actually work out much cheaper, and don’t cost the earth. Get together and help each other to make curtains and clothes, or find someone local who has the skills and get them to teach you. Being creative and sitting back in the warm fuzzy glow of having made something yourself beats any shopping spree. It’s fun, it’s satisfying, it’s original and is often a fraction of the cost. So why not be the change and make more from less, make conscious choices how we spend, who we give our energy to, how we share our resources? Have you got an idea, a resource or a site to share? Whether you are just starting out and learning to sew or just love making things with fabric, making a simple bag is a fun way to spend a wet afternoon. Unless your lifestyle is totally Zen you are bound to have something around the house that lends itself to recycling or more correctly, upcycling. 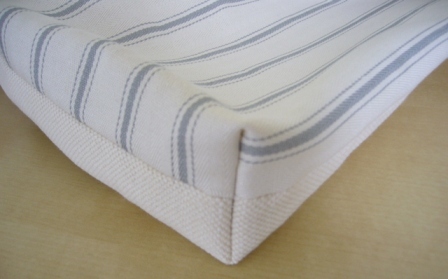 Tea towels for example are excellent, or old pillow cases, sheets or duvet covers, as long as the fabric is strong and still in good order. Old cushion covers can also be good candidates. We’ve used old jeans, too. Begin by edging the two pieces of fabric if it is likely to fray, either with a zigzag stitch or an overlock stitch if your machine has one. Pin the two pieces right sides together. Sew down the sides and across the bottom, leaving top edges open. Press seams open. 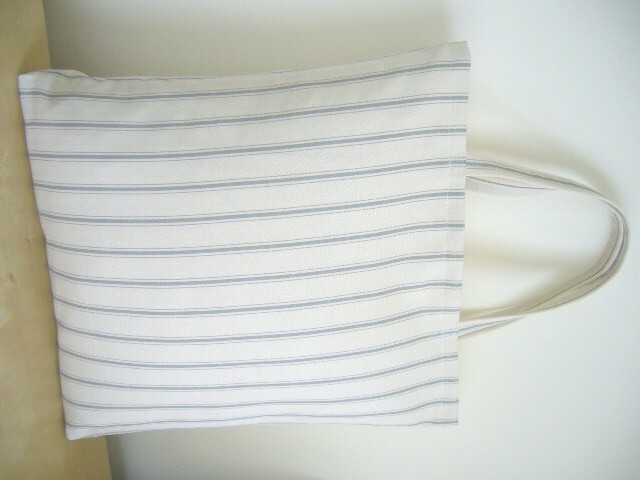 We’ve used Grey Striped Ticking for the front of the bag and a plain white canvas for the back. In each of the corners match the side seam with the bottom seam creating a point. Pin in place. Make straps. Fold in 1″ along the whole length of the long edge and press. Repeat this for the other side, leaving a small gap in the middle so there is no overlap when the two sides are folded together. Fold, press again, pin and sew in place. Oversew ends or press under 1/2″ to get a clean edge. 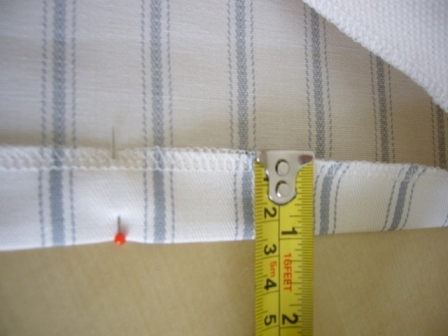 Measure 4 1/2″ in from the side seam and mark either with a pin or chalk. 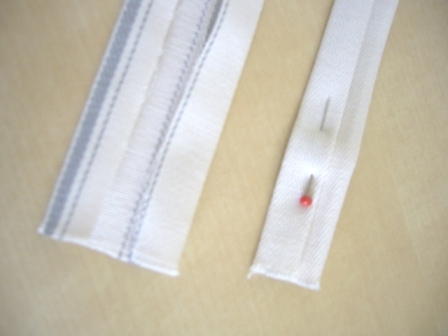 Place one end of the strap alongside the pin or chalk mark or as close to this measurement as possible matching stripes as shown, and pin. Repeat for all four straps. 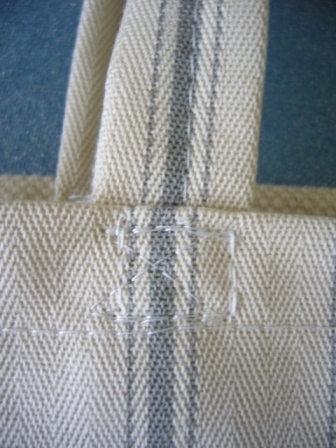 Stitch straps to bag with either a box or multiple rows of stitching to make sure the straps are strongly secured. Add you own designs to the front panel, eg embroidery, hand-painted designs, applique, patch pocket from an old pair of jeans, buttons, beads, iron on patches. It’s easier to do this before making up the bag, so plan your design first if you can. 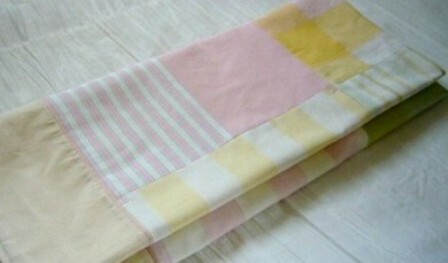 Choose a modern stripe, or if you’re a fan of shabby chic or boho chic go for it. Make the bag bigger or smaller. You can make it long and narrow, or make the bottom corner sections bigger so the bag becomes wider. The straps can be made narrower or wider, or you can use twisted cord, leather straps, or wooden hoops. 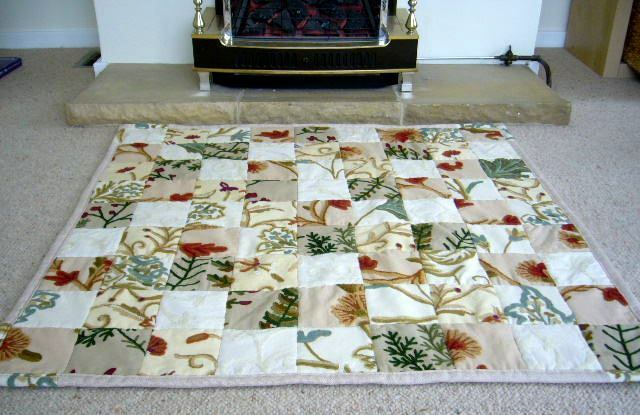 If you want to use up lots of small pieces of fabric you can create a patchwork panel in the desired size with a plain back, or use patchwork for both. Straps can also be made of multiple pieces as long as they are securely stitched and not too bulky. For thinner fabrics you might need to use either double thickness or stitch the lighter fabric to a lining fabric, or you could use iron on vilene to get a firmer result. Crafting is fun, and carrying your own bag is so much nicer than carrying some brand name around on your arm. Your bag will last much longer than a plastic bag and will be washable and eco-friendly, too. Advertise your own creativity, you never know someone might ask you to make one for them, and they make great presents. Boot fairs can be good places to find odd pieces of fabric or check if your local church or scout troup are planning a garage sale. 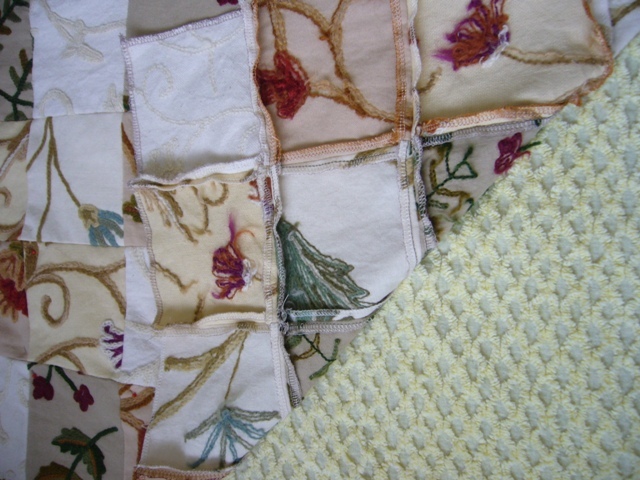 You can find patchwork packs in our eBay shop or go to www.designercushionsandthrows.co.uk where we will soon be selling organic linen, cotton and hemp if you want to become more green. Send in your photos and we can vote for the most creative. This Director’s Chair was looking rather tired. The fabric had faded in the sunlight but was otherwise in good condition, although the area where the screws hold the back panel in place had become stretched and weren’t holding the back section upright anymore. 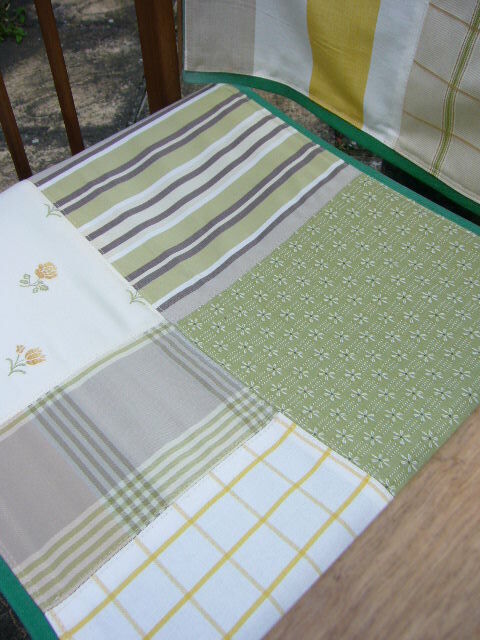 I decided to give it a makeover and made patchwork from a variety of strong cotton fabrics in complementary greens and yellows in florals, checks and stripe patterns. At the same time I reinforced the areas where the back bolts slot through into the frame to make sure they would hold securely. 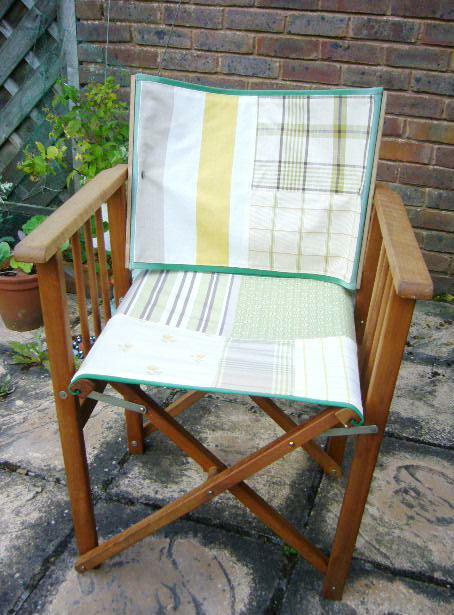 The end result has not only given the chair a fresh feel but means that it will last a lot longer as stitching the patchwork on top of the original canvas has given it extra sturdiness. I also gave the wood a coat of Danish oil as it was rough and dry and had been bleached by the sun and this will also help to protect it from the elements, although I probably won’t leave it outside in the rain as that would spoil the pretty patchwork over time. Is this recycling or upcycling? A bit of both maybe? 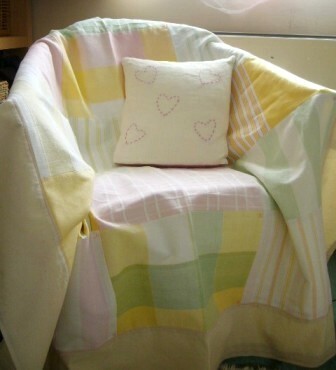 The fabrics used were recycled materials from pattern books, and the chair became enhanced and of value again as a result. The chair itself is a good example of ‘precycling’. This is when the materials used to make a product are chosen for their environmental footprint prior to production. The wood from the frame could be repaired many times over and when it finally reaches the end of its life it can be used as firewood. The oil used does not contain any chemicals that could be harmful. 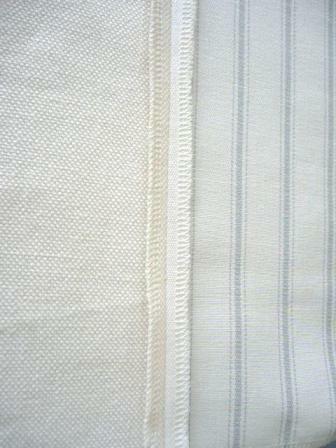 The fabrics are a mix of cotton and linen and are biodegradable over time and will become compost. The bolts could come in handy for repairing something else at a later date. Have you got any projects you would like to tell the world about? 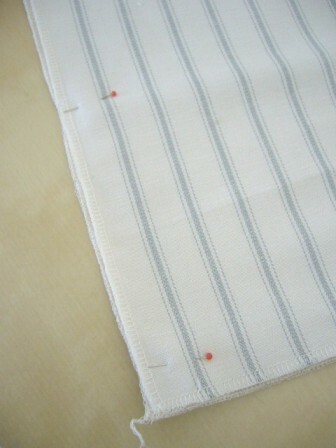 Find the middle of a long border strip, and mark with a pin, fold or pencil dot on the wrong side of the fabric. Do the same for the patchworked piece and match the centre points. Pin carefully in place and sew together, leaving ends extending away from sides (approx 17cm). Repeat for the bottom edge. Repeat the above for the side borders, trimming away any excess length once you have matched the lower part of the side strip to the sides of the top/bottom borders, which now lies between. 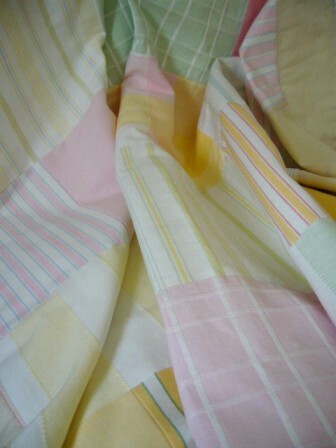 At this point you can add a layer of wadding if you wish for a warmer, padded quilt. Pin the wadding at regular intervals making sure that the fabric lies flat and that there are no folds catching in anywhere. Basting the wadding in place will help to reduce any movement. 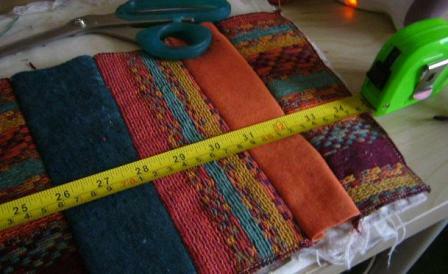 Lay out the completed top layer, right side up, either on a large table or on the floor, and taking exact measurements of the finished piece cut the lining fabric to size. 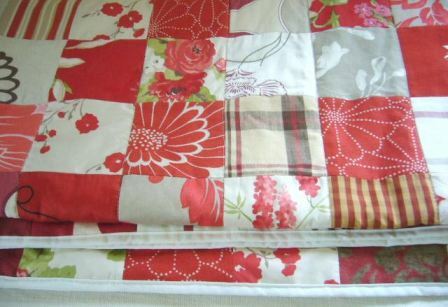 Place the lining fabric over the completed patchwork with right sides together matching side seams and corners. Sew around the outside edges of the throw leaving 40cm open along the bottom edge. Turn the throw inside out and press around the edges, folding in and pressing the seam allowance at the bottom opening, and then handstitching this closed. 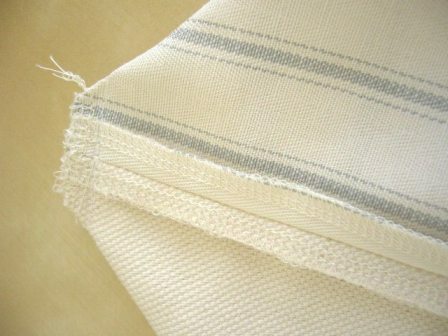 Press the whole throw until you have a good finish to the edges and the seams are all well settled. 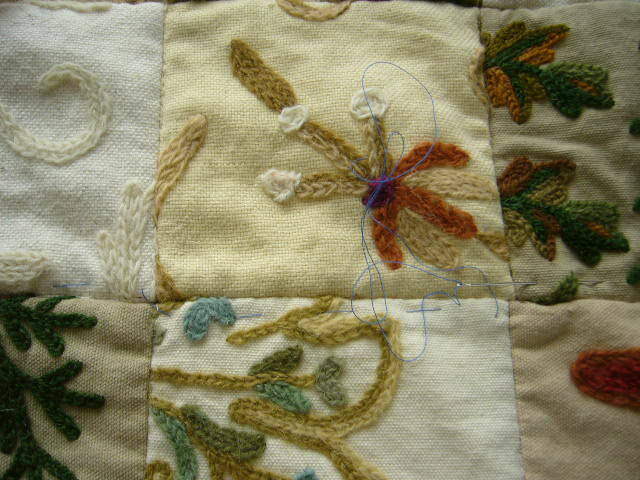 Top stitch around all four edges about 0.5cm in, and again on the inside of the border edge. You can use the same colour or choose a contrasting colour as a feature. 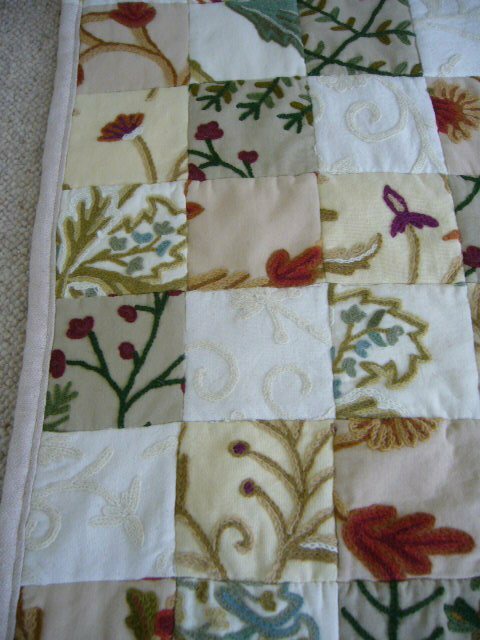 To anchor the throw in the middle section, we used a small decorative flower feature stitch in the corners of every other square. This holds the layers together while allowing them to be flexible at the same time. For a more quilted effect you can sew down every seam from top to bottom, and across in a grid, but bear in mind that this requires greater accuracy in the preparation of your piece as any discrepancies in measurements will surface at this stage. You can also use crochet cotton to “tie in” the layers at the corners of the patches. 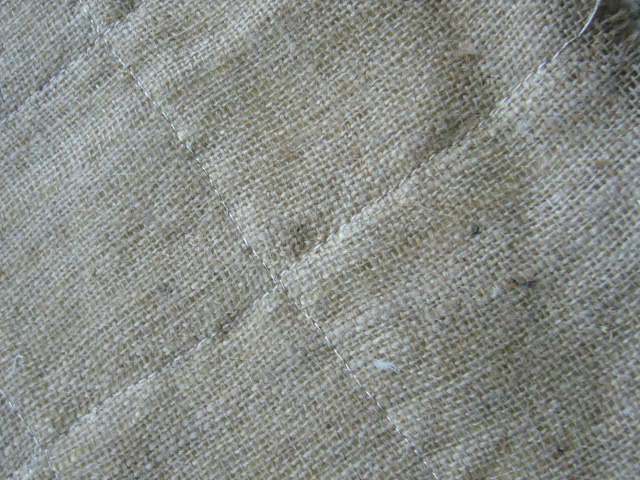 Stitch through from the top with the thread leaving the end free, coming back up, down and up again, then double tie and trim the ends leaving tufts, for a more rustic or shabby chic style finish. Again you can make a feature by using a stronger colour. 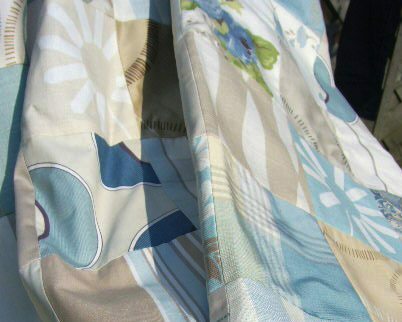 From a recycling perspective, you could also use fabric from old curtains, or old shirts to make this throw, as long as the fabrics are of a comparable weight, clean and in good condition. A variety of textures and colours can be fun. 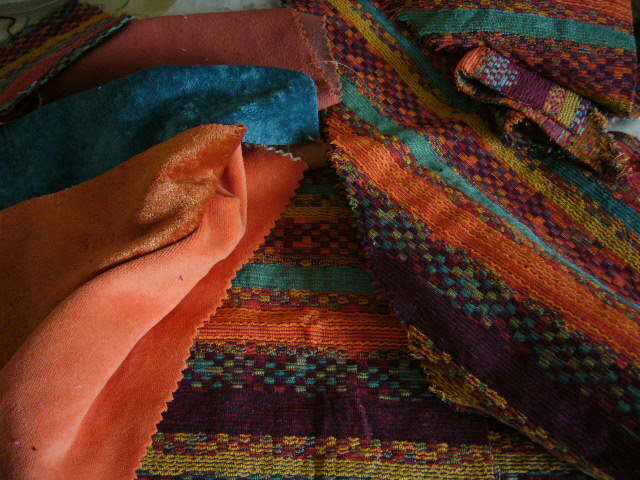 Making eco soft-furnishings yourself with recycled materials contibutes to a more sustainable way of living and brings great pleasure both in the making and use of the finished item. If you would like to let us know how you get on, or have ideas to share, or other examples of upcycling, we’d love to read them in the comments box. 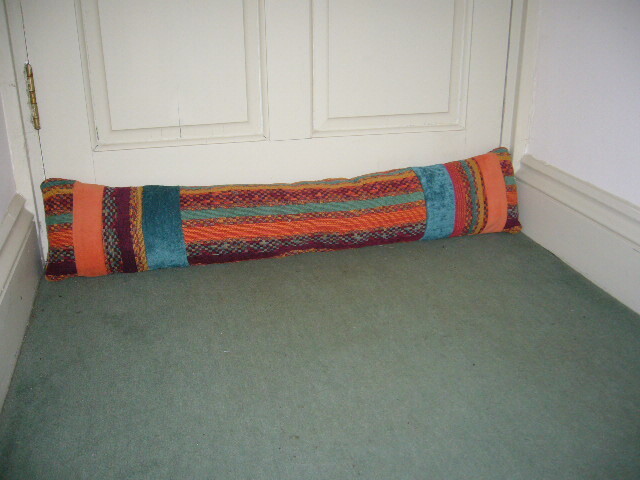 Now that autumn is here and those nights are becoming chillier and the wind is often gusty, how about checking some of those draughts and saving on the heating bills by making your own door draught excluder? It’s easier than you think. You don’t have to have a single large piece of fabric, any scraps will do. You can mix and match a range of colours and textures to create a lovely bright feature for your hallway. Here’s how ……. Play with different combinations of colour and texture until you find a combination that you like. You can create all sorts of ‘looks’ – rustic, shabby chic, modern bold stripes of colour, anything that matches your own style of decor and colour scheme. Sew all the pieces together allowing at least 1/2″ (or 1.5 cm) for seams. If the fabric looks likely to fray it may be better to overlock the edges if you can, but as the seams will be inside the draught excluder this is not usually necessary. Continue to join fabric pieces together until long enough to fit the door, plus seam allowances at each end. We made ours 34″ (cut 35″ with seams) long which is fairly standard for a front door, and 7″ wide as the door has a stormboard outside and we wanted to be sure to cover the gaps to each side. Repeat the process to make a second strip of fabric. Press all seams open. Place both fabric pieces together, right sides facing and stitch around the edges, leaving a 6″ gap to turn right sides out and to add the filling. You don’t have to buy special wadding. We used scraps of fabric cut into strips. You could also use an old towel, old pullovers or T-shirts, or old socks. As long as they are clean! 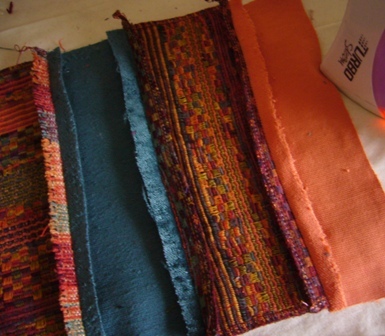 You could even use shredded newspaper, or if you have some old cushions that have become matted you could use the fillling. There are all sorts of eco-friendly materials you could use. Once you have enough filling in place, fold the edges in, press and pin in place. 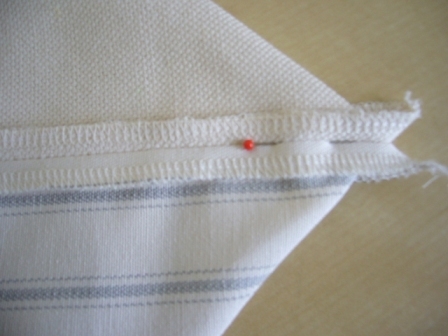 Close the seam either using handstitching or machine very close to the edge. Your door draught excluder is ready to go. Got some ideas you want to share?